Our Horace Superstore south of Fargo at Exit 56 is open year round by appointment for out of state residents. Give us a call to set something up! For 2018 we are introducing even more new and exclusive products that have been developed to provide you with the very best fireworks show! The Dakota Series and Memory Series are a line of fireworks we designed and sell exclusively at our Memory Fireworks locations. We stand behind our fireworks! View our No Dud Guarantee. Home of the 3 L's. Lowest Prices, Largest Selection and Locally Owned! 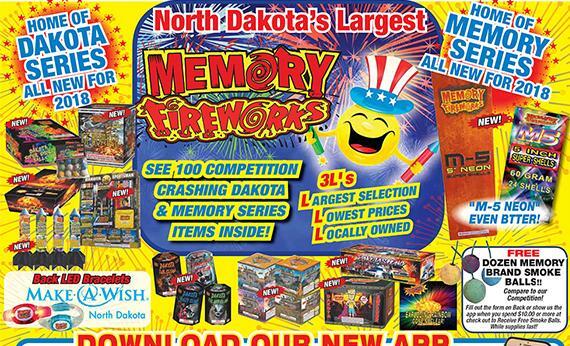 Open June 27th through July 4th 8am – 11pm (July 5th hours may vary) South Fargo is open year-round Memory Fireworks has more locations in North Dakota than anyone else. Use the map below to select the pin point nearest you. Enter your email address to receive notifications of upcoming contests as well as seasonal updates and coupons. We offer the largest selection in ND. Our prices are the lowest period. You'll find our staff to be knowledgeable and friendly. 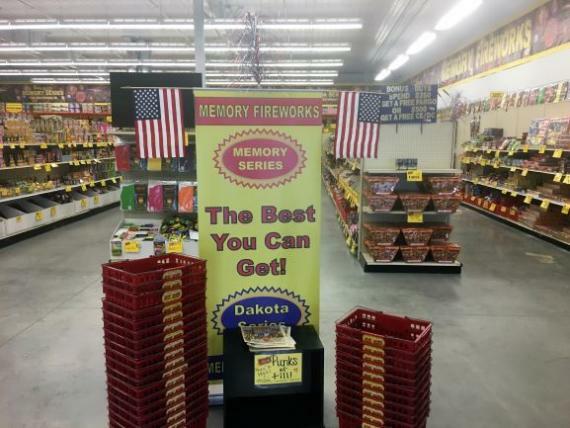 The Memory and Dakota Fireworks series are exclusive to Memory Fireworks and are hand-picked the absolute best fireworks for the money. We have a large variety of Memory Lanterns in all colors and multiple themes. 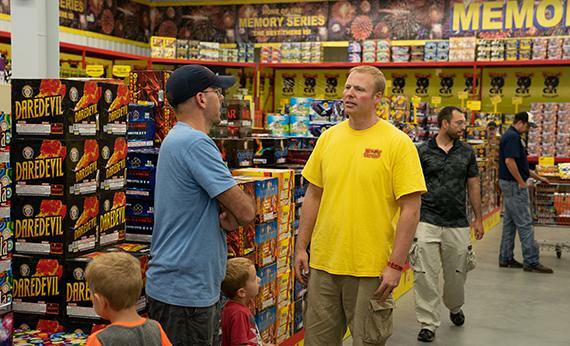 Our Fireworks retail locations are strategically placed to make it easy and convenient for you to shop. Memory Fireworks offers an industry leading No-Dud guarantee! Memory Fireworks is a Local Family Owned Business. Memory Fireworks Locations cover the entier state of North Dakota. 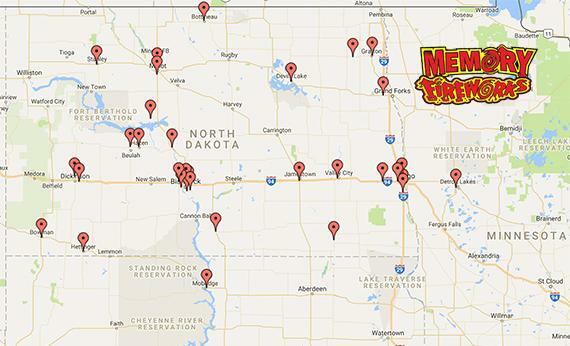 Memory Fireworks has 37 locations across North Dakota and 1 in Iowa. 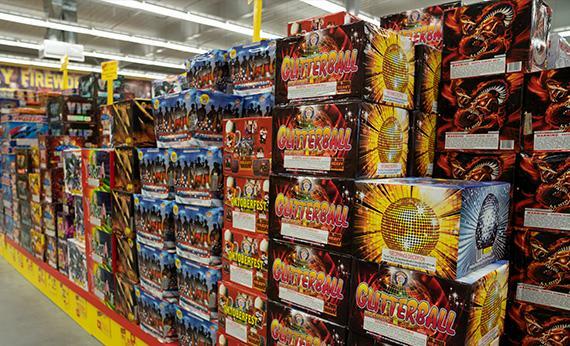 Memory Fireworks has the Largest Selection of Fireworks, Artillery, Rockets and Missles at the Lowest Prices. Memory Fireworks home of the 3 L's. Largest Selection, Lowest Prices and we're Locally Owned! Called the number listed on the website and was promptly called back by Dave who was very helpful. The store is open year round for out of state residents by appointment. Don't feel like your firework needs are too small either, because I only got a case of 40 large snappers. Great service and will for sure get my fireworks here again. We stumbled upon Memory Fireworks in Horace, ND about 5 years ago. What a find!!! Dave and Ashley and the whole crew are top of the line. The customer service is like no other! Great selection of fireworks for adults and children. I give them my budget and they put together a fabulous show. You tell them what you like and they will make it happen. 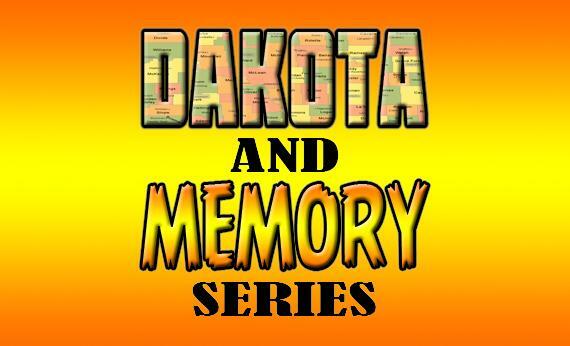 The are very knowledgeable about their products and you can't beat the Memory and Dakota series. I have family that now drive up from Minneapolis because they too enjoy the great service and wonderful selection. They will even open up for you if you need fireworks for other events. If you love your fireworks this is the only place to shop!! Incredible service and accommodating! I wouldn't go anywhere else.!!!!! !